At some point I thought to myself “I wonder, what’s the biggest gun I can comfortably carry and conceal?” To haul around maximize firepower comfortably means off-body carry. Since I work in a professional environment my first thought was a briefcase with foam cutouts, which I’ll still probably do, but then I was introduced to the concept of an Active Shooter Bag. Basically it’s a bag a law enforcement officer (LEO) would grab while responding to a call of an active shooter. It contains extra ammo for the officer’s patrol rifle, medical gear and other helpful items. 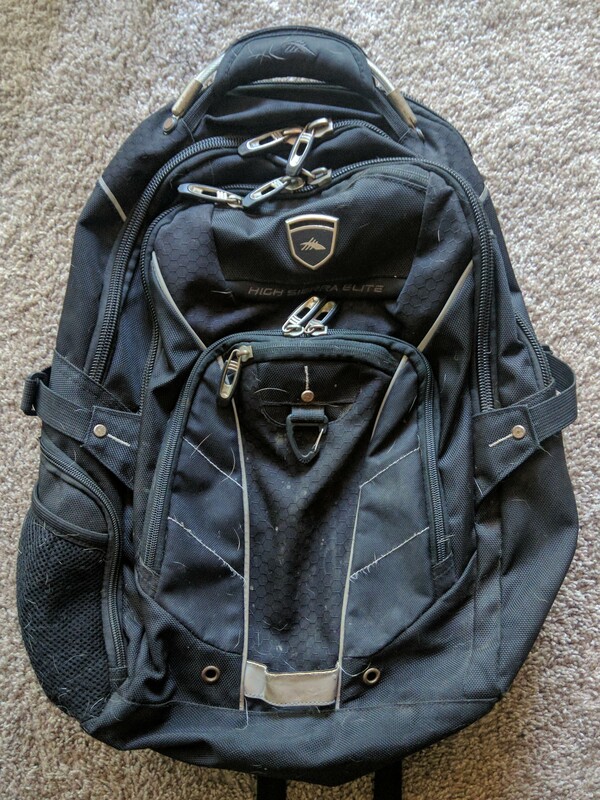 Paul Howe, owner and operator of Combat Shooting And Tactics (CSAT), has a PDF article [here] where he discusses Active Shooter Bags in further detail. As I’m not a LEO I changed some elements and decided to “Archerize” it. The first change was going with a backpack. This lets me carry the absolutely biggest gun possible without drawing attention. 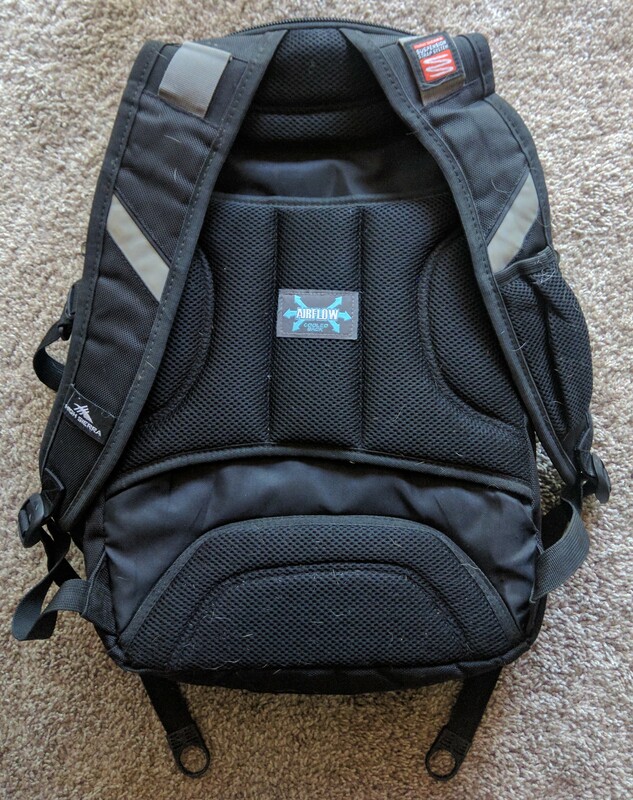 A laptop backpack is specifically designed with several compartments that make it ideal for my uses. I was gifted one that I’ve been using for several years that has held up very well and looks used. I don’t want a spiffy new one that would attract thieves. Someone hauling around a dirty looking pack probably doesn’t have anything worth stealing. I had been considering something like the SIG Sauer MPX or CZ Scorpion EVO when I ended up trading into a Wilson Combat AR9 (reviewed here). Starting with a Wilson Combat AR9 I added Troy Micro sights, a Trijicon RMR riding an ADM mount, a Law Tactical Gen3-M Folding Stock Adapter, and Streamlight TLR-1 HL ‘Long Gun Kit’. With the folding stock adapter it fits perfectly into my backpack. I built it out under the premise of taking up as little space as possible while still having full features. 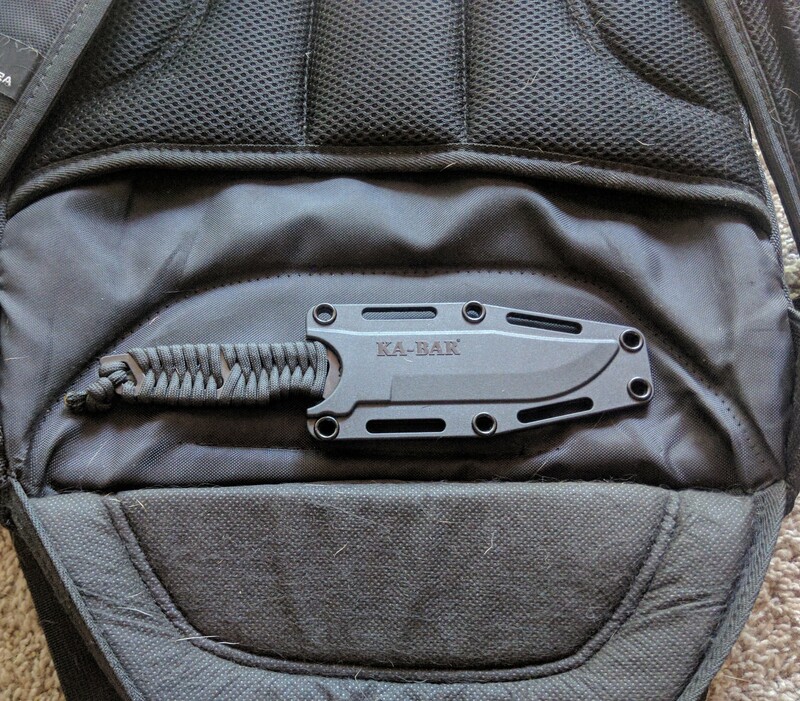 A knife that can be easily and quickly accessed was high on my priority list, but a tough one to fulfill. I thought about mounting it on the backside of the shoulder straps but that starts to interfere with long-term comfort and isn’t fully concealed when not being worn. Ideally I needed a hidden pocket along the back facing panel. Aside from some odds and ends the next major component was medical supplies. If you’re at a concert in the park when some nut case shows up and starts shooting, after the threat is neutralized the focus turns to any gun shot victims. Instead of trying to pull off a victims belt to use as a tourniquet or applying pressure with a piece of clothing, a few inexpensive items can be included in the pack that are much more effective. And finally the last piece is some ballistic protection. While we train to search and assess after a shooting it’s easy to get fixated and not notice the second bad guy approaching quickly from the near. Or if, for example, you’re walking down the sidewalk and suddenly find yourself facing a threat and his buddy slips in behind you. While this is a really crap situation to find oneself in I would feel significantly better having something protecting my back. Now the tricky part, putting all the elements together in a practical and useable way. Covering my six is an AR500 Armor backpack plate with PAXCON coating. It’s 9.5″ by 13″ and fits perfectly in the laptop compartment of many backpacks. Since my pack has a particularly large laptop compartment I needed to do a little modifying. If I just put the plate in the compartment and then put on the backpack, the plate was riding too low, I wanted coverage up higher. The hard part was how. The plate comes in at 8 pounds so attaching it to the backpack interior wasn’t an option. I needed a base for it. The problem is I don’t exactly have a workshop nearby and I wanted something lightweight. I looked at what I had available and it occurred to me that the cases Fiocchi uses for their ammo is both lightweight and very strong. A simple backing was needed to keep everything in line, a sturdy piece of cardboard fit the bill. I grabbed some packing tape and I went to work. It may not be pretty but it’s functional and completes its purpose. I didn’t want it to be too rigid, that would just make it uncomfortable. The base is 6 ammo boxes individually wrapped together and capable of holding a lot of weight. My only real concern with sturdiness was keeping the plate on top of the base. The 3 ammo boxes on top of the base bind it and give a shelf for later use. The pocket itself is slim enough to offer all the other support it needs. This let’s the base and plate flex but remain stable. Going in I had my concerns about how it would hold together and I was pleasantly surprised at how beefy it is. I was taught at a young age to buy good quality knives. KA-BAR is probably one of the most well-known knife makers out there and I just happen to have a couple sitting around. The one I decided to use for this project was their ‘Neck Knife’. The handle didn’t offer much in the way of grip so I wrapped it in paracord. The paracord increased the girth and grip, making it significantly better. I get that it’s designed to be worn around the neck and having a skeleton handle is lightweight but I think they could have done something to give it a better grip. Deciding where and how to mount the knife was one of the most challenging parts of this project. There were ways to conceal it but then it wasn’t easily accessible and vice versa. I started examining how the backpack was put together, specifically the lower back padding. I decided to take a chance and remove the stitching along the top portion, hoping it would let me create a pocket for the knife. This area was ideal as I could access it quickly while still keeping it hidden. I cut the thread and started carefully removing the stitches, opening up a perfect pocket for the knife. Next came a way to attach the sheath and some way to keep the flap up but accessible. To attach the sheath I used Velcro. Then to hold the flap up I attached a couple of magnets. It stays hidden and can be quickly reached while wearing the backpack. The medical compartment has a red LED flashlight attached to the zipper for easy location. Inside are 3 ‘medical packs’ I put together. With each in a Ziploc bag there’s no digging for different items, just grab a pack and go. Inside each pack is: 2 sets of gloves, a 6″ Israeli bandage, 3 rolls of gauze, 4 chest seals, and a tourniquet. In addition I also carry a set of EMT/trauma shears. You don’t want to be cutting through clothing with a pocket knife. Spare mags are always a must. The AR9 holds 19+1 rounds, which I picked for space reasons. If that turns out not to be enough I also have a 33-round magazine onboard. If 53 rounds of Federal HST doesn’t fix the problem then it’s a really, really, bad day. The ledge I built into the ballistic support is the resting place of the magazine. With a few careful cuts through the compartment divider the full loaded magazine rests securely. I also keep a few extra items onboard. From doubling as a tourniquet to quickly securing the hands of a down suspect if you’re a LEO, zip ties serve many uses. I opted for 22 inch heavy-duty ties. I’m a big believer in lights and lighting. I carry a flashlight, 2 LED key chain lights, and several lightsticks. Also spare batteries that run the flashlight and weapon mounted light. And finally the last item is a bottle of water. In total the backpack tips the scales at 26.2 pounds. There’s a lingering question, what’s the practical application of something like this project? Well, did ever get lost at night in a big city you don’t know well and find yourself in a bad part of town? Suppose you then encounter car trouble and need a tow truck. I’ve never seen a tow truck get somewhere in under an hour. Were you sitting duck in a sketchy area I’d bet you wouldn’t question the value of having a pack of your own. Other options can include going to an outdoor event with the family. Large gatherings are easy targets for people looking to commit evil deeds. At the end of the day though sometimes you have to do things for less than practical reasons, simply because it’s fun and you want to. Great article. Awesome outside the box thinking. Seems like you are completely prepared. I was wondering if one tourniquet is really enough. Thanks, Brian. Each pack only contains one tourniquet but I have a total of 3 onboard. I would like to have more but they run $32 each so the cost adds up quickly. The way Israeli bandages are designed they can also pull tourniquet duty. Great read, that old backpack in the closet just may have found a new purpose in life! Glad to see this as it gives me some great ideas for my own planned bag! How did you attach the magnets? A dab of super glue locked them in place.